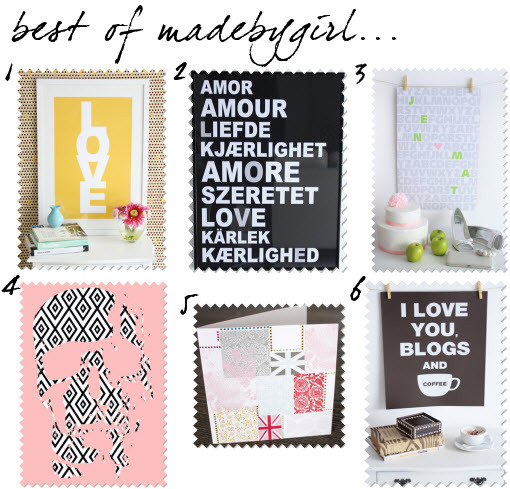 If you’re a regular on the style blog “circuit” then you’ll no doubt be familiar with ‘Made By Girl’… and if you’re not, allow me to introduce you. Created by Jen Ramos to compliment her online shop MadeByGirl (which sells a range of typography cards and prints – take a look), her blog has built up an impressive and loyal community, eager to infuse some of her distinctive style into their lives. Jen covers such topics as, “interior design, art, food, fashion and pieces of my own life”, complimented by vivid imagery, and with her friendliness and enthusiasm always shining through in her writing. *Sigh* I can only dream of a home like this, she really pulls of minimalism without it being to stark and clinical. I love the subtle splashes of colour and the fact it still looks homely and has a lived in feel.